In the 143rd Jewish Seleucid year (169/168 B.C.E., Nisan or spring reckoning) the Greek king of Syria, Antiochus IV, began his suppression of Judaea in an attempt to Hellenize the country. As part of this attempt, Antiochus IV forbade the Jews by threat of death from observing their national customs and sacred days.1 This forced Hellenization policy pushed different groups into hiding and resulted in the Maccabean (Hasmonaean)2 revolt, which began in the winter of 167/166 B.C.E. In 164 B.C.E. this revolt led to the subsequent defeat of the Syrians holding on to Jerusalem. Shortly thereafter the existence of the Sadducees and Pharisees is formally acknowledged by the records. This representation does not reflect the reality of the period prior to 70 C.E. During these earlier years the Sadducees remained a viable force and their differences with the Hasidim spread into every aspect of religious doctrine. At the core of this ongoing dispute was the struggle for political power and the issue over who had the right to interpret Scriptures. The separation between Sadducees and Pharisees (who later became the Talmudists) stems back to the basic doctrines and philosophies of each group. Within the scope of our present discussion and the next post we shall examine the philosophy of religion for each group to determine how they arrived at their respective positions. We shall then proceed to examine the political struggle between the Sadducees and Pharisees and demonstrate how the Pharisees suppressed the Aristocratic views, including their understanding of how to observe the Festival of Passover and Unleavened Bread and the Festival of Pentecost. In this post, we will begin with the discussion of the Sadducees. The Sadducees—Hebrew צדוקי (Tsadoqi), צדוקים (Tsadoqim), i.e., Zadokites; Greek Σαδδουκαῖοι (Saddukaioi)—were the conservative descendants, supporters, and sympathizers of the family of צדוק (Zadok, Tsadoq), a Levitical high priest living in the days of King David. The conservative Sadducees advocated the Aristocratic Passover practice (System A). There seems little doubt that they received their title because of their support for the right of the Zadok family to control the Temple and to hold on to their traditional role as chief priests. Already suffering a setback by the pro-Pharisee position of Queen Alexandra,17 the power of the Sadducees began to wane further when they opposed Herod the Great’s move toward the throne of Judaea. With the backing of full Roman recognition, Herod was able to seize power in Jerusalem in early 36 B.C.E.18 During the years of his drive for power, Herod rewarded those who supported him, including the Pharisees. The minority party of the Sadducees was able to continue in positions of power during the reign of Herod because they had learned their lesson and had aligned themselves with Herod and the ruling authorities. Further, Herod still resented the majority of the Pharisees.20 It was Herod the Great and the Romans who subsequently appointed the high priest and favored the loyalty of the Sadducees. • First, the Romans ousted the family of Herod the Great from power over Jerusalem in 6 C.E.22 Though the Sadducees continued as high priests, civil and religious power gradually shifted toward the Pharisees, who enjoyed the support of the masses. This power shift is reflected in the changing composition of the Sanhedrin, which held control over the civil affairs of Judaea, and with the membership of the priesthood. In the days of the Hasmonaeans, the Sanhedrin and the priesthood were both dominated by the aristocratic Sadducees. With the absence of the Temple, there was no longer any need for the Levitical priesthood, as required by the Torah of Moses. The philosophical approach of the Sadducees was conservative. The anti-Hellenic Sadducees became allies with the Hasidim (Pharisees, Essenes) during the Jewish revolt against the Greek rulers of Syria. These political realities became the source of much resentment on both sides. The authority of the Sadducees to be the rulers, judges, priests, and high priest in the theocracy came by means of the Torah. The reinterpretative methods used by the rabbis, on the other hand, were a direct threat. For the Sadducees, the real problem with the oral laws was that most were not even inferred by Scriptures. They were simply the inventions and traditions of men. Yet, the Aristocratic Sadducees went even further. They also believed that if a doctrine or religious practice could not be explicitly found in the Torah it should not be followed at all. This school, as a result, carried on the understandings of Scriptures passed down through the ancient Levitical Zadok priesthood. The doctrines of the Sadducees, as a result, reflected the ancient traditions and order of the Levitical priesthood as opposed to the “alien” innovations of the Pharisees. This fact suggests that the Sadducees also observed a more ancient form of the practices used by the priests for the celebration of the Festival of Passover and Unleavened Bread (System A). Their aristocratic, arrogant, and boorish manner of life left them unpopular among the general populace. This fault was exacerbated by their continual slide into petty self-interest. For that reason, as time progressed, the power and popularity of the Sadducees faded while the star of the more liberal Pharisees became brighter. Time to take a break everyone before we continue with the second part. Please continue to read on with 11. Passover-Sadducees & Pharisees II. 1 Macc. 1:20-64; 2 Macc. 6:22-7:42; Jos. Antiq., 12:5:4-5. 4 1 Kings 4:1-4; cf., 2 Sam. 8:17, 15:24-37; 1 Chron. 6:1-59. John Dam., 16, notes that the name Sadducees meant “the most just” and that they were derived “from a priest named Sadok.” צדוק (Zadok, Tsadoq) in Hebrew means “just” (SEC, Heb. #6659); “was righteous, equitable . . . acted justly . . . was in the right . . . justified, cleared, himself or another.” (HEL, p. 218). Also see 8. 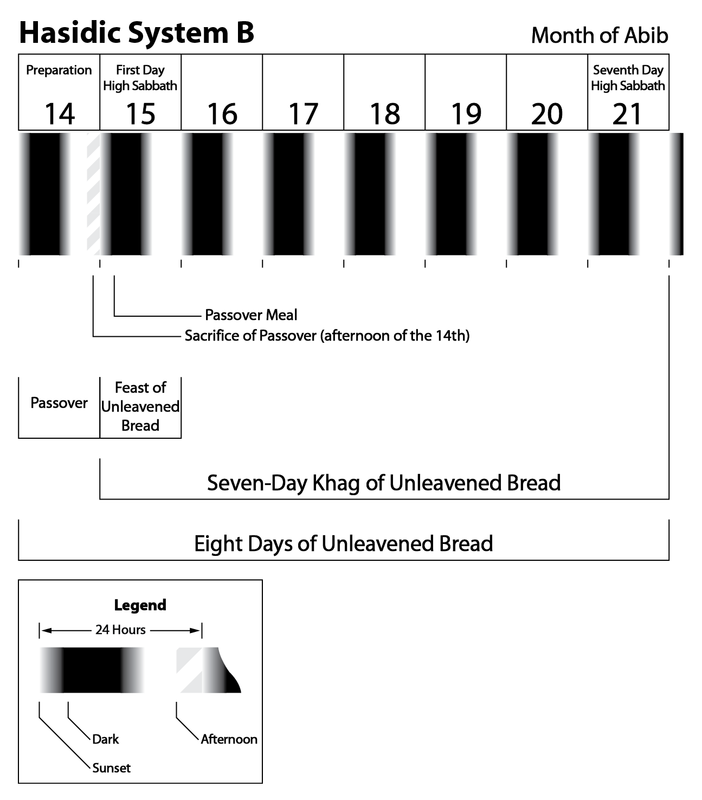 Passover – The Dark Period I, n. 31. 5 The high priesthood continued in the Levitical family of Eleazar, the son of Aaron, until the time of Eli, a descendant from Ithamar, the son of Aaron (Lev. 10:1-2, 12, cf., 1 Kings 2:27 with 2 Sam. 8:17; 1 Chron. 24:3). The conspiracy of Abiathar, the fourth in descent from Eli, led King Solomon to depose him (1 Kings 1:7, 2:26-27). The office thus returned to the house of Eleazar in the line of Zadok. It continued in that line until political intrigues in the time of the Seleucid king Antiochus Epiphanes led to the deposition of Onias III. Thereafter the position of high priest became the patronage of the ruling power. The last high priest of the Zadok line was Onias IV (Onias Menelaus), who was executed in the year 162/161 B.C.E., Nisan reckoning. 6 For the history of Onias IV (Onias Menelaus) see Jos. Antiq. 12:5:1-12:9:7, 20:10:3; cf., 2 Macc. 4:23-10:38, 11:1-13:8; Meg. Taan., 11. 10 EJ 14, p. 621. 11 HJP 2, p. 411, cf., p. 413. 12 Jos. Antiq. 13:5:9, in context with 13:5:1-8. 14 HJP 2 pp. 401f, 413. 15 Jos. Antiq. 13:13:5 §376, cf., 13:15:5. HJP 2, p. 401; MDB p. 681. 17 For her pro-Pharisee position see Jos. Wars, 1:5:1-4, Antiq. 13:15:5-13:16:6. 19 Jos. Wars, 1:18:1-5, Antiq. 14:9:1-5, 14:16:2–15:3:7. 21 For the evidence of the Boethusian Sadducees and their high priests during the Herodian period, we will address in a later post of this series. 22 Jos. Wars 2:7:3-2:8:1, Antiq. 17:13:1–18:1:1, 18:2:1. 23 HJP 2, pp. 213, 235, 405, & n. 7 on p. 405. 24 HJP 2, pp. 402, 414; EJ, 14, p. 622; EBD p. 902; NBD p. 1124; CBTEL 9, p. 241; DB p. 579. 25 HJP 2, pp. 402, 414. 31 That the Sadducees did not believe in the resurrection see Luke 20:27-40; Mark 12:18-27; Matt. 22:23-33; Jos. Antiq., 18:1:4, Wars, 2:8:14; B. Sanh., 90b. 32 CBTEL 9, p. 236. 35 CBTEL 9, p. 235. 39 JE 10, p. 632; OTP 2, p. 642. The text has been attributed by some to the Pharisees and by others to the Essenes, but in either case it would be a Hasidic view. 40 Cf., Ps. Sol. 1:1-8, 4:1-10, 8:8. This entry was posted on 01/14/2013, 2:00 pm and is filed under Calendar, Easter, Feast Days, Jews, Passover, Religion, Unleavened Bread, Yahshua, Yahushua, Yahweh. You can follow any responses to this entry through RSS 2.0. You can leave a response, or trackback from your own site.